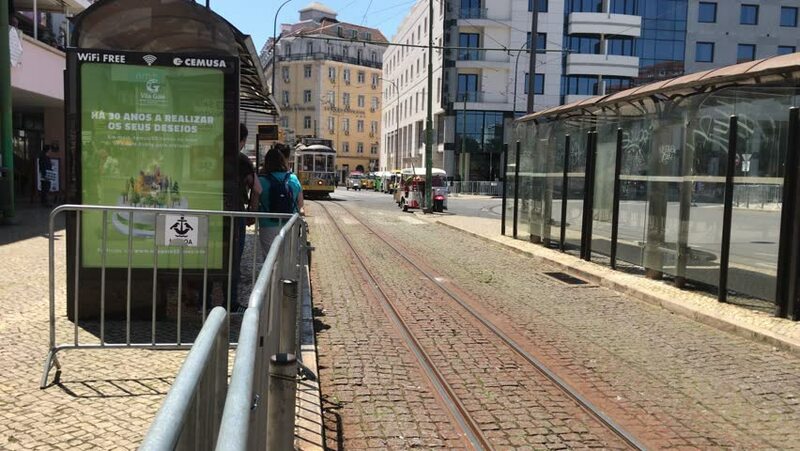 Lisbon, Portugal, May 6, 2018: Tram 12 arrives at one of its downtown stops. hd00:21Riomaggiore, ITALY - CIRCA 2016: People get in and out of the modern passenger train at the station Corniglia. The train represents the best way to visit all the villages of the Cinque Terre. 4k00:09New Jersey, May 2017. Amtrak train arrives at small station platform. hd00:12SOUTH PASADENA, CA - NOVEMBER 6, 2013: A Gold Line Ansaldo Breda P2550 train arrives at Mission Station in South Pasadena on November 6, 2013. The train seats 76 people and has a top speed of 65 mph. 4k00:11IMOLA, ITALY - JULY 2018: People walking on Train station platform.